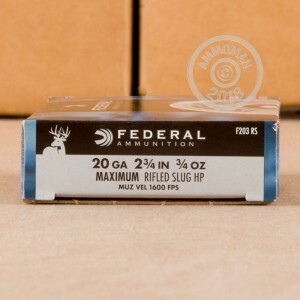 Federal Power Shok slugs are a great choice for you next day out in the field. Each hull in this case of 250 is 2-3/4" and carries a 3/4 oz. rifled slug. These slugs are intended to be shot through smooth bore barrels. By achieving a muzzle velocity of 1,600 feet per second, these shells are sure to deliver the knock down power you need. 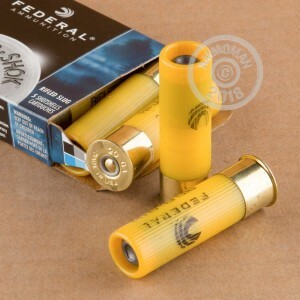 Federal Premium ammunition has been a staple among shooters and hunters for decades. 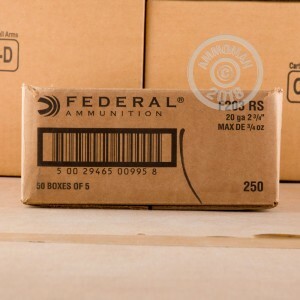 Since 1922, Federal has produced high quality, American made ammunition in their Anoka, Minnesota facility. Good news, all orders over $99 receive free shipping from AmmoMan.com! Grab a case today and get out in the field soon!